The 2019 $0 down, VA home loan limit for Valley County is $484,350. Valley County offers some of the most abundant fishing opportunities in Idaho. One of the many great locations to go fishing is Hells Canyon of the Snake River. Hells Canyon is home to many fish species, including bass, steelhead, and salmon. Even large fish species live in Hells Canyon, including white sturgeon that can grow up to 10 feet long. For more secluded fishing opportunities, be sure to visit one of the Alpine Lakes. The lakes provide excellent views of the surrounding mountains. For some of the best views in Idaho you have to visit one of the beautiful trails in Valley County. A popular trail is the Eagle Nest Trail, which is 11.5 miles long. The trail is considered easy and provides great views of the Horsetheif Reservoir and Cascade Valley. A trail for more advanced hikers is the Hazard Lake Trail, which leads to several fishing spots. Other popular trails in Valley County include Twenty Mile, Goose Creek Falls, Box Lake, and more. Most of the trails allow bike riding and horseback riding. The Tamarack Resort is a mountain resort in Valley County that brings in visitors from all over the county. Featuring seven ski lifts, a ski lodge, ski rentals, and several other amenities, the Tamarack Resort has everything you need for a great ski trip. There are numerous housing and hotel options at the resort. Large cottages, which can hold up to six guests, can be rented for a nightly rate. There is also a restaurant, pool area, hot tub, and gym at the Tamarack Resort. Other ski areas in Valley County include Little Ski Hill and Brundage Mountain. Veterans living in Idaho are offered many great benefits, including education benefits, healthcare benefits, tax breaks, and much more. The median household income in Valley County is $50,473, and the median housing cost is $221,200. Contact VA Home Loan Centers to complete your VA loan application today! 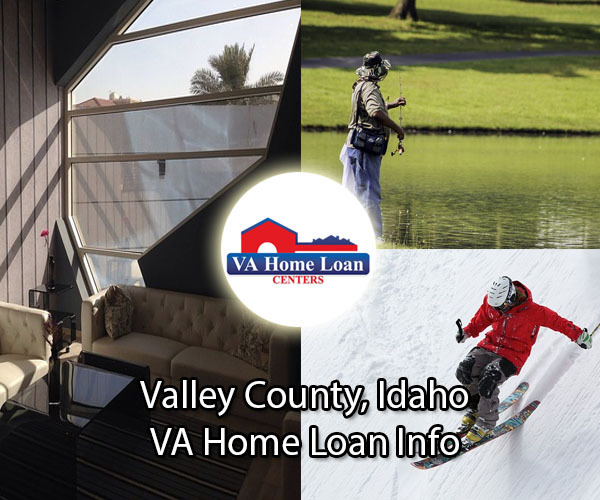 For help finding a VA-approved property in Valley County, call VA Home Loan Centers at 888-573-4496. There do not appear to be any VA-approved condos located in Valley County. Obtaining condo approval is easy! Find out how by clicking here.